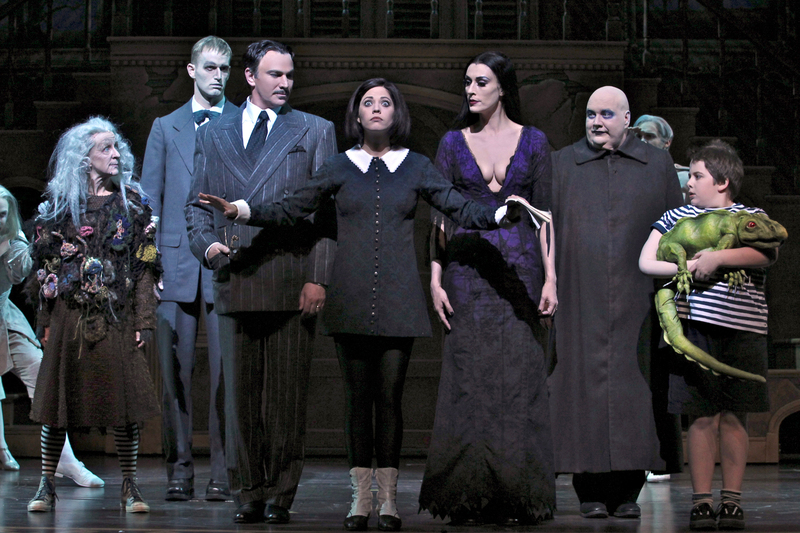 Creepy, Kooky, Mysterious-And Musical: When You’re “The Addams Family”, Touring Is A Scream! K, so they’re NOT the folks next door–or even farther down the block; they’re “The Addams Family”, and in the hit musical named after them they actually live in New York’s famed “Central Park”. Regardless of where they may call home though, watch out–because they’re gonna pay a call on a town near you! Now in its second year casting a shroud of good-natured gloom across the Great White Way, a new touring production opened on September 15 at “The Mahalia Jackson Theater For The Performing Arts” in New Orleans LA, before heading across the country. 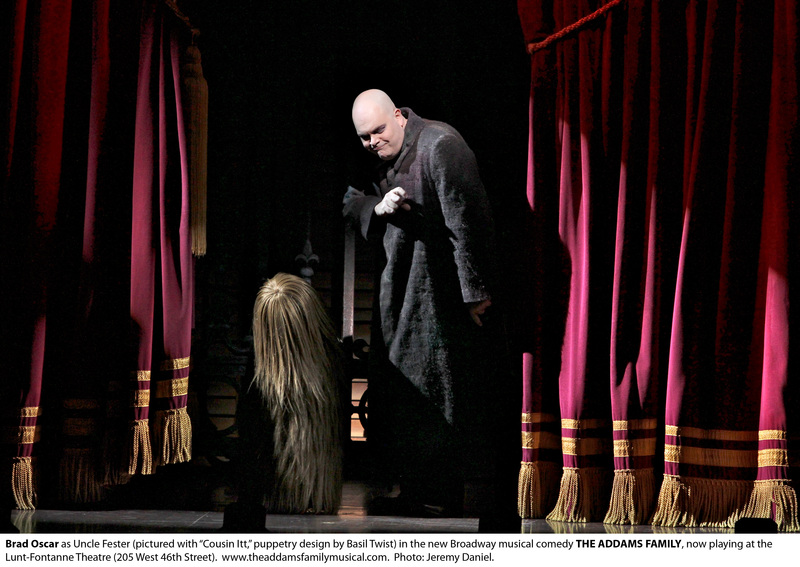 If ever a theatrical achievement shrieked “crowd-pleaser“, “The Addams Family” is it! Beginning performances in March 2010 at the Lunt-Fontanne Theatre, this melodic re-imagining of an old favourite immediately became one of Broadway’s hottest tickets, regularly grossing over $1 million a week. Prior to making the move to NYC‘s world famous theater district, the musical grossed a phenomenal $12,031,010 during its initial eight week try-out at the Oriental Theatre in Chicago, making it the most successful pre-Broadway engagement in that city’s history! Then again, given that they all first became pop-culture fixtures through their monthly appearances in “The New Yorker’ Magazine, the show seemed almost predestined for Broadway. Maybe that’s why in this version, the big gothic mansion they all dwell in has been set right smack-dab in the middle of “The Big Apple’s” most renowned wooded esplanade. "You must admit we're not what people call 'Laid-Back', so can't we muse a bit and lose the Basic Black?! " 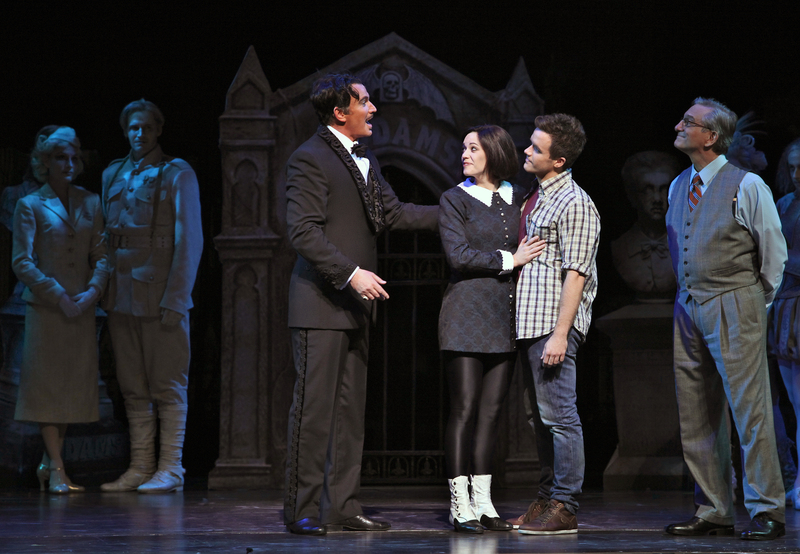 In the national tour, Douglas Sills and Sara Gettelfinger lead a supernaturally talented cast of 25 as the macabre married couple, Gomez and Morticia, with Patrick D. Kennedy as son Pugsley and Cortney Wolfson as daughter Wednesday. Rounding out the bizarre brood, Pippa Pearthree is Grandma, and Tom Corbeil is the family’s faithful, if fearsome-looking butler, Lurch, while Blake Hammond’s Uncle Fester is, of course, still the amiable oddball we love. This time however, he’s possessed with a gentle wisdom and romance, whose ‘ode’, “The Moon And Me” ranks as one the pieces’ most endearing. Joining their outlandish group of (as Gomez puts it,) “the living, the dead, and the ’undecided’,” are the Beinekes–Lucas and his Parents, Mal and Alice. Performed with the appropriate amount of bemusement, Martin Vidnovic is Mal, Crista Moore is his wife (who herself has a peculiar habit of talking in rhymes,) and Brian Justin Crum is their love-struck offspring, Lucas. 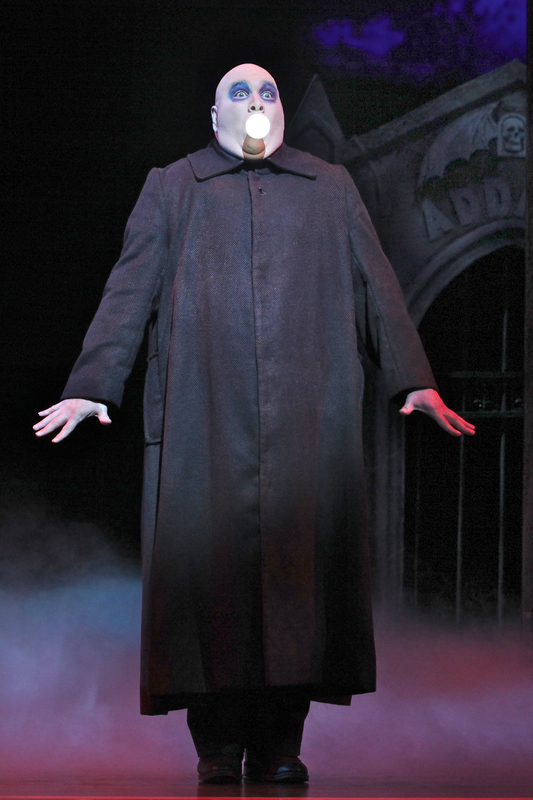 As everyone's favorite uncle, "Fester"--Blake Hammond is as 'electrifying' as ever! Together, the book by Rick Elice and Marshall Brickman and the lyrics by Andrew Lippa (–the man also responsible for the music,) beautifully capture that snappy ’punch-line” style of Charles’ darkly witty panels. Without a doubt, Lippa’s Tony-Award nominated score is a magnificent mix of mirth and morbidity–with a few insightful observations regarding life, love and familial relationships scattered around here and there. Likewise, all the members of this crazy clan get their musical moments in the spotlight. Indeed, this is definitely one time you shouldn’t judge a book by its cover–nor songs by their deceptively frothy subject matter. For example, in “Happy/Sad”, Gomez perfectly expresses every father’s inevitable mixed feelings concerning his child’s impending marriage, when he sings “And now a boy says he adores she who once was your–how can I ignore such news?! I‘m sad AND happy–why should I choose?” Given such a brilliant meeting of sentiment with the composer‘s finesse, this one could foreseeably become a standard for father-daughter dances at wedding receptions everywhere. So too, the relationship between Wednesday and her ‘younger’ sibling, Pugsley–something never really explored or defined in earlier incarnations, takes on a nice (and, in perhaps an appropriately ‘strange’ way– nicely relatable,) depth here. In his solo turn “What If”, we discover that Pugsley honestly enjoys how his “Big Sis” tortures and torments him, even feeling a sense of loss when her new-found “sunny disposition” compels her to cease doing it (“What if she walks away, leaving me A-Ok, hiding each power tool–oh, why would she be so cruel? 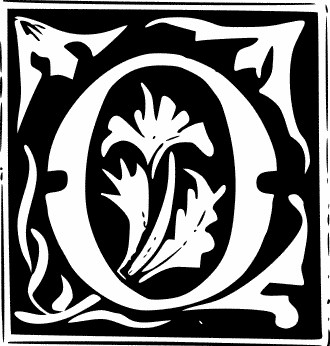 !” He asks forlornly.) At the other end of this tuneful spectrum, Morticia’s near-Vaudevillian second act opener, “Death Is Just Around The Corner” is surprisingly cheerful and undeniably charming! Believe it or not, this is her attempt at an upbeat thought–complete with a kick-line of phantoms and a few campy one-liners thrown in for good measure: “Corner (sung as ‘Coroner‘) –Get it?” she winks. Nonetheless, it’s just the type of bouncy melody that stays with you long after you’ve left the theater. This number also demonstrates one of the more clever staging devices featured in the show. 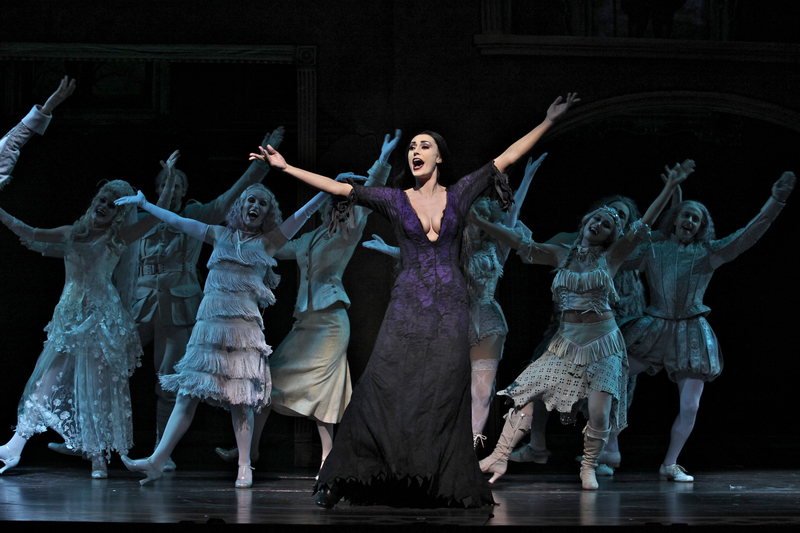 Whereas most productions face the challenge of creating a logical reason for its chorus to enter and exit that fits a given situation, considering that in this case the background players are all ghosts of the Addams Ancestors, they can each literally fade into the shadows once the final step is danced, the last note is sounded. "I can face a new tomorrow (...if I make it through today!)" Sara Gettelfinger is the always enchanting "Morticia"
This entry was posted in Theater reviews and tagged Andrew Lippa, Broadway touring productions, Charles Addams, Douglas Sills, Fabulous Fox Theater St. Louis, Hit Musicals, Mahalia Jackson Theater for the Performing Arts, Marshall Brickman and Rick Elice, National Tours 2011, New Orleans Theater Season, Sara Gettelfinger, The Addams Family Musical, Tony Award nominated scores. Bookmark the permalink. Generally I don’t learn post on blogs, however I wish to say that this write-up very forced me to take a look at and do it! Your writing taste has been surprised me. Thank you, very great article.